The Birmingham Business Alliance’s Governmental Affairs Committee recently welcomed Clark Jackson, senior manager for the Southeast region at the U.S. Chamber of Commerce. Jackson spoke to the GAC about everything from top legislative priorities to earmarks and tariffs. Take a look at what she had to say. Birmingham Business Alliance: Tell us a little about your role and the work of the U.S. Chamber. Clark Jackson: I work in the Southeast Region office for the Chamber, which is located in Atlanta. The U.S. Chamber is the world’s largest business organization. We represent more than 3 million businesses of every size, sector and region across the country. That includes our members and partners at the state and local Chambers of Commerce, like the BBA, as well as the state. Our role in the regional office is to work with local chambers, state chambers and corporations who are in our region to make sure we stay on target and we’re talking with the same voice about federal policy, what’s going on, what’s good for business and making sure local and state chambers are engaging their members on federal policy. We’re working in D.C. to make sure the business environment is conducive for you all to do what you do best, which is create jobs. The D.C. office has about 550 employees. We are a rather large organization and the majority work in the policy section of the chamber. We have about 75 employees that work in our foundation and look long-term into the future and think strategically about where the business community should be going as far as workforce issues. Hiring Our Heroes is a great program we do as well. We work with local industries and make sure veterans and spouses are employed or come home with jobs. We are also working on workforce and pipeline issues, keeping industry engaged on what’s working best in that field. Policy divisions include everything from energy to transportation. The largest policy division is our international folks, who work in every region around the world. Trade, health care, regulatory reform, anything you can think of that affects business, we have a policy team for all of those. It’s a robust group of folks working in D.C. to make sure you can do your job here in Alabama. 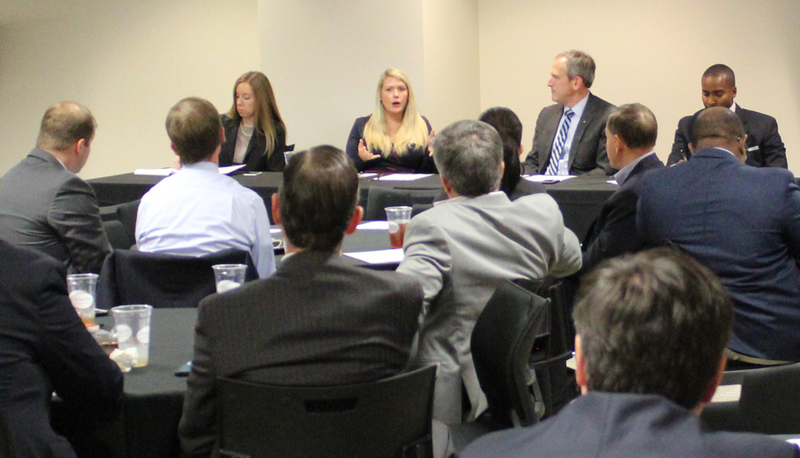 BBA: What are the Chamber’s top legislative priorities? C.J. : Looking forward to 2019, things to work on include infrastructure. That’s a bipartisan issue and is very important to the Chamber and our members. NAFTA, or USMCA, will be a big early priority for us. Making sure we get that through the House and Senate. BBA: There is a consistent rumor that earmarks are coming back. Have you heard anything on that and would you be supportive of earmarks being reinstated? CJ: It’s something Democrat leadership talked about supporting, particularly when it comes to an infrastructure package, and Republican leadership is talking about that as well. So yes, it’s very possible that earmarks come back. Something like a transportation package is always easier when you have little parts that help all the Members, especially those Members wavering on a yes or a no. If there’s a project included for their home state or district, it’s much easier to get a yes. From a Chamber standpoint we don’t get involved in the inner workings of Congress. But the answer is yes, it’s definitely something being talked about, that we see as a way to move something like transportation. BBA: Alabama is at the forefront of U.S. auto-making with recent projects in our region such as Autocar and Mercedes-Benz. The state of Alabama as a whole produces more than 1 million vehicles per year with approximately 4,000 jobs connected to the industry. The U.S. Chamber has stated that Alabama would be the second hardest hit state from proposed tariffs. How do you see the next few months shaking out post-midterm on this issue? CJ: Midterms will have a small impact. Tariffs are driven by the Administration. President Trump feels he’s able to use them as a negotiating tactic or tool not only with China but also with some of our better trading partners like Canada, Mexico, the European Union and Japan. The Chamber is very outspoken on its opposition to tariffs, period. Tariffs are a tax on consumers, and we don’t support them in any way, shape or form. We are one of the most outspoken in D.C. about how potentially devastating they are, not only to a lot of industries but particularly to the auto industry. The auto industry has doubled its workforce since 2011, and it is a growing sector for the U.S. and is extremely important to the economy, not only in Alabama but all over the country. Even if you don’t have a huge auto manufacturer in your state, you probably have supply chain manufacturers working in your state and it affects the whole country. The main message point to the Administration is they’ve done such a good job in so many aspects of getting the economy going again, through tax reform and regulatory reform, and tariffs would take all that growth and turn it backwards. Steel and aluminum tariffs included and imposed on Canada and Mexico were meant to be a negotiating tool for NAFTA to get both countries on board for the new NAFTA; we’ve seen the new NAFTA package for the most part, and the 232 tariffs are still on the table. I’m not really sure how that works out, I was with Majority Whip Scalise and someone asked “what do you see in 2019?” He said “I see a tariff-free 2019 this time next year.” That’s positive thinking that at least a Member of Congress, if not the Administration, is thinking that way. We’re hopeful, and there’s a lot of talk going on with the EU and Japan. Hopefully we can take back some of the tariffs, if not with China, than with other partners. BBA: Over the last few years, there have been lots of conversations revolving around better aligning industry and education. What are some steps being taken to address workforce development issues and increase the talent pool? CJ: We’ve always felt that the state and local chambers and county and local governments do the best job at figuring out what their industries and regions need from a talent pool standpoint. From a U.S. Chamber standpoint, we feel education is extremely important and making sure we’re funding CTEs as well as four-year universities. We had some great progress this year with the Perkins Act, and passing CTE legislation that paves the way for you guys to work better. Our goal is that nothing on the federal side is impeding any growth being done on the local level, making sure that government is staying out of the way and not taking anything away from a great ideas that you guys have. BBA: What are your thoughts on Opportunity Zones? CJ: We have been working on and are still in the early stages of how we’re going to work with them, but we think it’s a huge opportunity for growth. We are working with some of our top, largest members, our corporate members on Opportunity Zones and are seeing if we can get some of them to relocate or open up new projects in Opportunity Zones. It’s in very early stages, but we are happy to partner or work with you. From our corporate folks who have the means to make these huge changes, they’re very enthused about doing this, and from a good place, not necessarily what’s best for the bottom line but what’s best for our country and where we’re going, willing to make the investment in places where they feel it’s important. BBA: What are your thoughts on funding infrastructure? CJ: The Administration came up with a large-scale infrastructure package of one trillion dollars, $300 billion federally funded and $700 billion public/private partnership. They worked really hard on the package. I would imagine the Administration will continue to push next year for a similar looking package, and the U.S. Chamber is very supportive of that package. The public/private partnership is a great way to move forward. Also, nationwide projects are extremely important that any state or local government can’t fund, like broadband; you need federal funding to put forward a big national project. If doing a federal package, it needs to have federal benefits. The Chamber has always said to increase the federal gas tax, and 25 cents is the most fair and easy way to come up with the $300 billion. We’ll continue to stand behind it and continue to push it as the most fair and easy way to come up with money that doesn’t take away from other programs. It truly is a user fee. If we are using infrastructure, such as roads, we should be paying to use them.